The Bachelor’s in Communication Science is a three-year program of 180 ECTS credits. 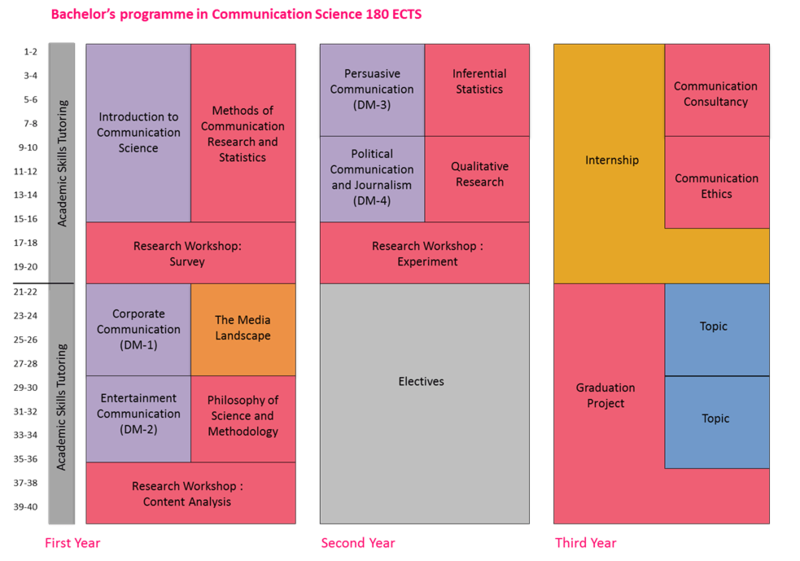 During the first year the students are introduced to the theories of Communication Science, as well as to the theories related to Methods of communication research and Descriptive Statistics, Corporate Communication, Entertainment communication, Philosophy of Science and the Media Landscape. In the second and third year the students are presented with in-depth information about Political communication and journalism, Persuasive communication, Communication ethics, Communication advice and research in practice. They also get to choose electives within the field of communication science and tailor their study program. Below you can find graph with the program’s content. Check the University of Amsterdam site for more information about the Bachelor’s program and the curriculum. Get acquainted with the courses taught during the Communication Science Bachelor’ program.